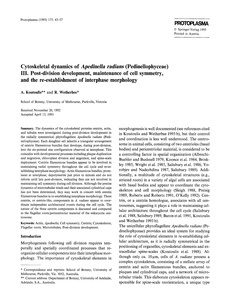 The dynamics of the cytoskeletal proteins centrin, actin, and tubulin were investigated during post-division development in the radially symmetrical phytoflagellate Apedinella radians (Pedinellophyceae). Each daughter cell inherits a triangular arrangement of centrin filamentous bundles that develops, during post-division, into the six-pointed star configuration observed at interphase. This coincides with developmental processes including plaque duplication and migration, chloroplast division and migration, and spine-scale deployment. Centrin filamentous bundles appear to be involved in maintaining radial symmetry throughout the cell cycle and re-establishing interphase morphology. Actin filamentous bundles, prominent at interphase, depolymerize just prior to mitosis and do not reform until late post-division, indicating they are not involved in maintaining cell symmetry during cell division. Although the precise dynamics of microtubular triads and their associated cylindrical caps has not been determined, they may work in concert with centrin filamentous bundles in re-establishing interphase morphology. Three centrin, or centrin-like, components in A. radians appear to coordinate independent architectural events during the cell cycle. The nature of the three centrin components is discussed and compared to the flagellar roots/pericentriolar material of the eukaryotic centrosome.